Slow cooker oatmeal is an easy overnight recipe! Use your slow cooker and have a warm breakfast ready to eat the morning. 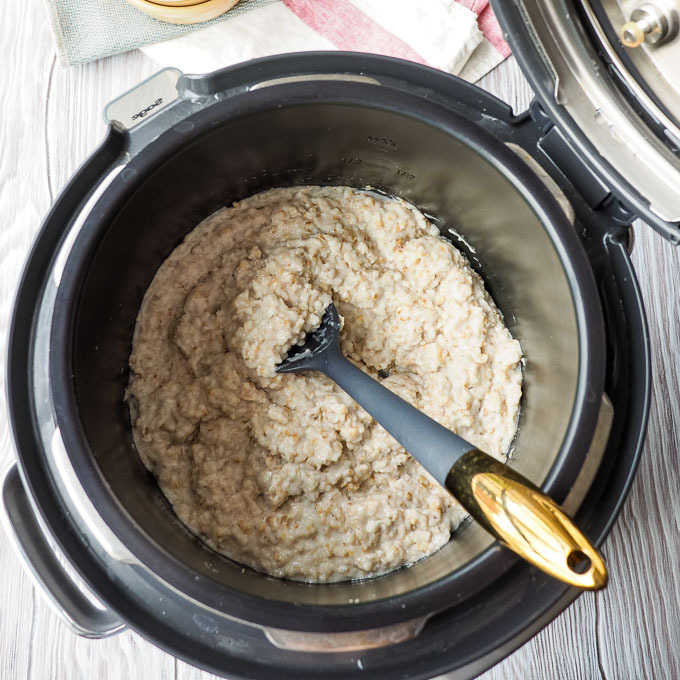 This overnight slow cooker oatmeal recipe uses steel cut oats. Making oatmeal in the slow cooker is easy! 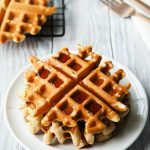 Using the slow cooker for breakfast is a major time saving hack to get breakfast on the table quickly in the morning. Cooking oatmeal in the slow cooker not only saves you time in front of a stove. It also results in a very delicious bowl of oatmeal. If I know my family wants oatmeal in the morning, I’ll always make it in the slow cooker. Breakfast is ready when we wake up, and I think slow cooker oatmeal tastes better that stovetop oatmeal. 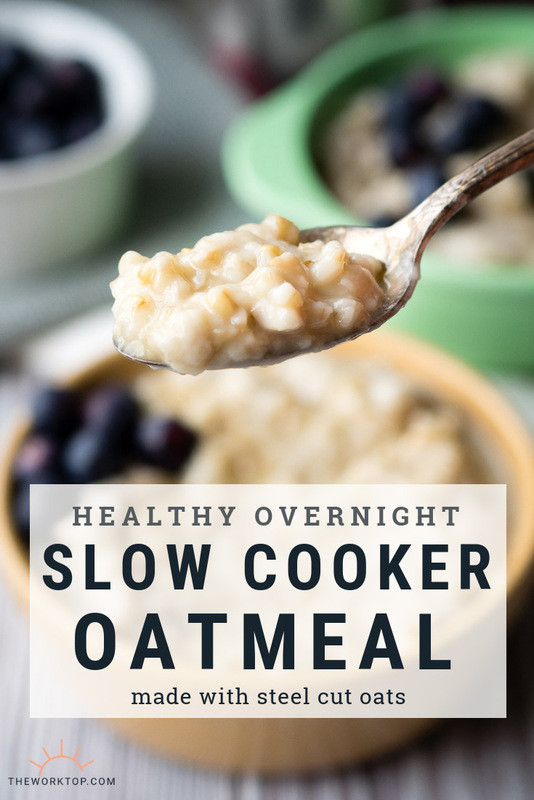 Why use steel cut oats for overnight slow cooker oatmeal? 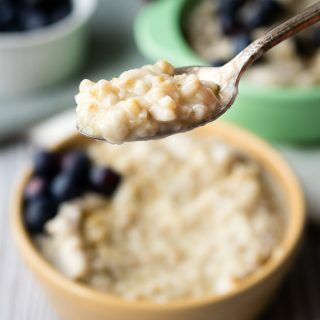 Steel cut oats work best for overnight slow cooker oatmeal because the steel cut oats can withstand the long cooking time and still hold its texture. Do not substitute old fashioned rolled oats for the steel cut oats in this recipe. It won’t work! 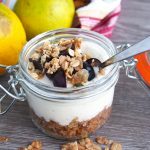 How to make oatmeal using a slow cooker? To make oatmeal using a slow cooker, you literally just need to mix everything together into the pot and cook. You don’t stir the oatmeal as it cooks. And you don’t even need to open the lid. I always grease the slow cooker pot before adding in the oats because I use every measure to prevent oatmeal from sticking. You can use a bit of oil on paper towel, or a non-stick cooking spray. How long to cook steel cut oatmeal overnight? Cook steel cut oats for 7 hours in the slow cooker overnight. I tend to set my slow cooker on before bed, and then turn on the keep warm function. That way, it’s still warm when I am ready for breakfast. What temperature should I use to cook this overnight slow cooker oatmeal? Make this slow cooker oatmeal on the low setting. Technically you can make slow cooker oatmeal on the high setting, but from my experience, the oats tend to stick to the pot more. That’s why this recipe uses a low setting. 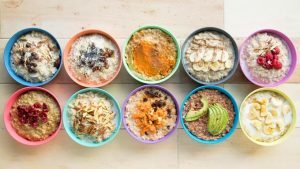 If you are using an Instant Pot as a slow cooker to make this oatmeal recipe, the “Medium” setting equals a slow cooker “Low” setting. How much water to use for steel cut oats in the slow cooker? If you read around for slow cooker oatmeal recipes, you might see other recipes suggest using 4 cups of water to 1 cup of steel cut oats. That ratio will give you an ok basic bowl of slow cooker steel cut oats. Ratio: Use 1 cup of steel cut oats to 3.5 cups of water and 1 cup of coconut milk. 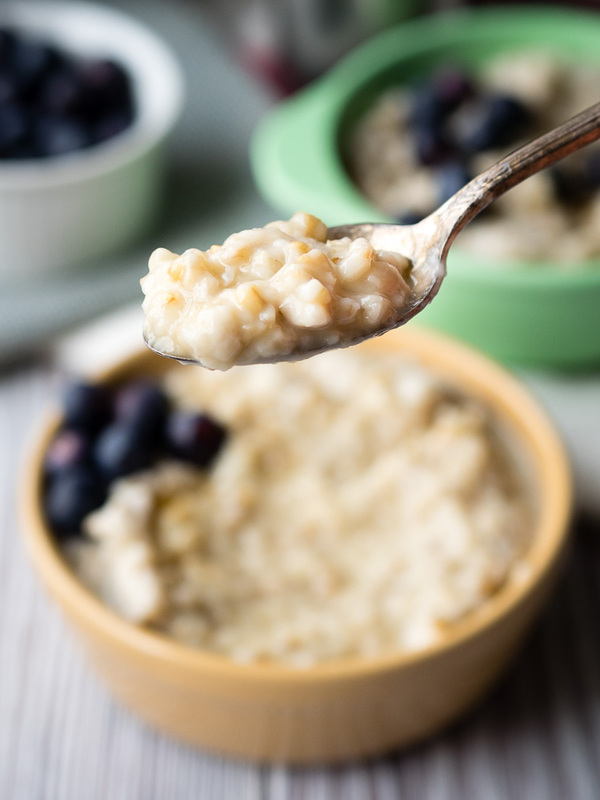 The coconut milk in this slow cooker oatmeal recipe gives the oats an extra creamy richness. And more practically, it keeps the steel cut oats from sticking to the slow cooker pot. While many slow cooker oatmeal recipes use a ratio of 4 cups liquid to 1 cup oats, I use a ratio of 4.5 cups liquid to 1 cup oats. The extra 1/2 cup of liquid also is a preventative measure so you don’t end up with your oatmeal sticking on the sides of your pot. So with this recipe you not only get an extra creamy bowl of steel cut oats, you also save on cleaning time. You can see in the pictures, the oats aren’t overly liquid. The oatmeal is ready to eat! The pictures of the oatmeal in the slow cooker pot and in the wooden bowl are before I mixed in any extra milk. The picture of the oatmeal in the yellow bowl is with a bit of extra milk mixed in. Typically, I always mix in a bit of fresh milk when I eat my bowl of slow cooker oatmeal. You can see the added milk in the overhead shot of the oatmeal below. How you eat your bowl of oatmeal is a personal choice, but you won’t go wrong with the 4.5 cup of liquid to 1 cup steel cut oat ratio. 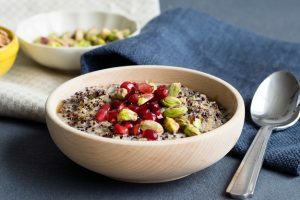 This steel cut oatmeal recipe should work in a Crock Pot, an Instant Pot, and other multi-cookers. I use my Sage (Breville) Fast Slow Pro to make this slow cooker oatmeal recipe. If you aren’t familiar with it, it is essentially an Instant Pot, and similar to other multi-cookers. There are so many models on the market these days, and each is slightly different, but generally the same. This next piece of information is a bit technical, but in order to help you make the best slow cooker oatmeal, it’s worth mentioning. Depending on the model of slow cooker you use, you may get a bit of variation to your slow cooker oatmeal. Why? This is because different models will allow varying amounts of steam to escape. TIP: If you are using a multi-cooker, steam escapes from the valve. You absolutely need to leave the valve open when using any of these multi-cookers as a slow cooker. But the difference is, I think it escapes at a slower speed than if you use a Crock-Pot. If you use your Instant Pot as a slow cooker frequently, you can buy this lid, which will make your Instant Pot function more like a traditional slow cooker in terms of allowing steam to escape. It’s not necessary for this recipe, but handy to keep around. 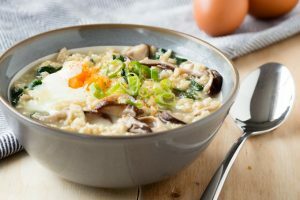 Can I double this slow cooker oatmeal recipe? Yes! 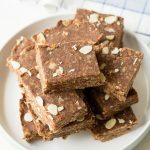 You definitely can double this recipe to make a large batch of oatmeal if you are feeding a group. Keep everything in the recipe the same, and simply double the ingredients. It’s also a great recipe to double if you want to make a batch of oatmeal to last several days. This recipe will feed a hungry family of four, so if your family wants oatmeal multiple times a week, go ahead and double the recipe. How long can you store slow cooker oatmeal in the refrigerator? Some sites suggest storing oatmeal for up to 5 days in the refrigerator. I tend to store for only 3 days maximum. If you are storing this slow cooker oatmeal in the refrigerator, make sure it is in an airtight container. Also, don’t mix in any fresh milk (dairy or non-dairy) before refrigerating it. If you want oatmeal as grab and go breakfast options, you can portion it out into individual containers and store it that way too. When eating this slow cooker oatmeal as leftovers, we simply warm up the oatmeal in the microwave and add in a bit more milk. As with all leftover oatmeal, give it a good stir to make it creamy again. What makes this slow cooker oatmeal so creamy? 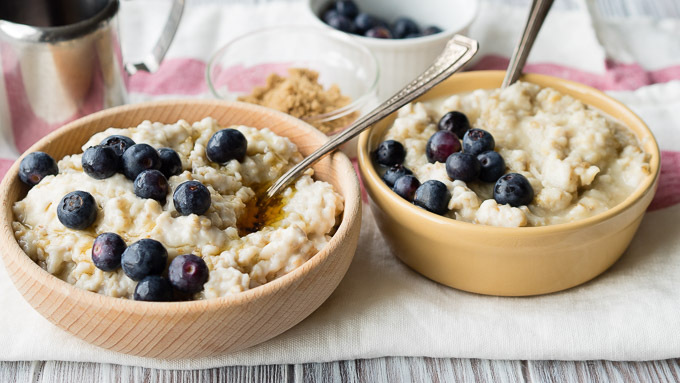 The secret ingredient in this slow cooker oatmeal recipe is coconut milk! 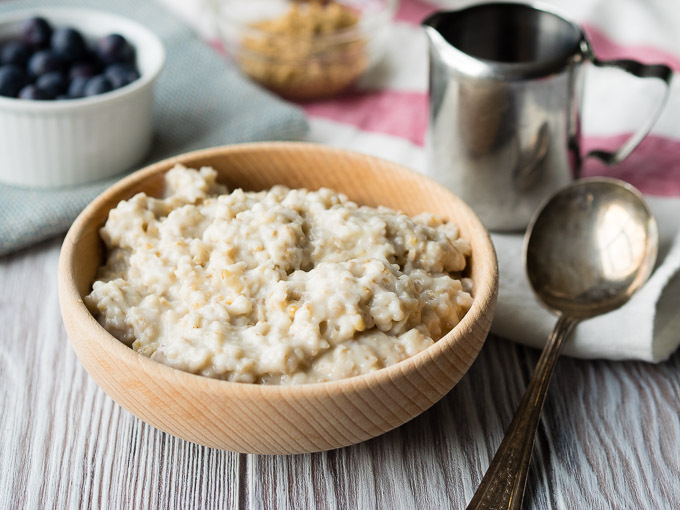 The coconut milk makes this oatmeal extra creamy, as well as prevents the oatmeal from sticking to the side of the slow cooker pot. It does impart a fruity flavor, but it’s not overwhelming. Make sure you use a canned coconut milk. Don’t use the coconut milk beverages sold in tetra-packs. The coconut milk beverage is often rice milk or water mixed in with a bit of coconut milk. 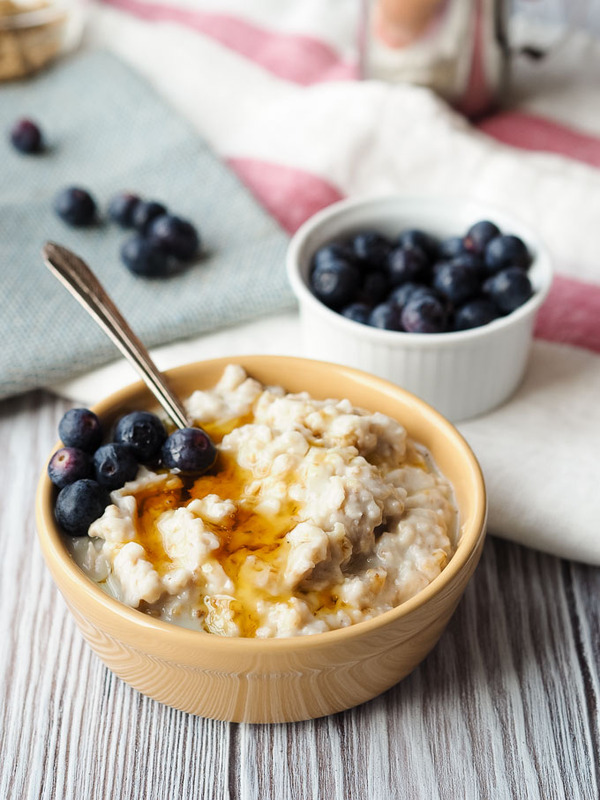 Enjoy this slow cooker oatmeal recipe! Any questions or comments, let me know below. Coat your slow cooker with oil. I just rub a bit on with paper towel, but you can also use a non-stick spray. Add in the oats, coconut milk and water. Gently give it a stir. Close and set your slow cooker to cook on low heat for 7 hours. If you have a keep warm function, you can use that setting for after the 7 hours are up. When the oats are done, give them a quick stir. 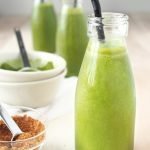 If you would like, you can add in some more milk or water to get to your desired consistency. 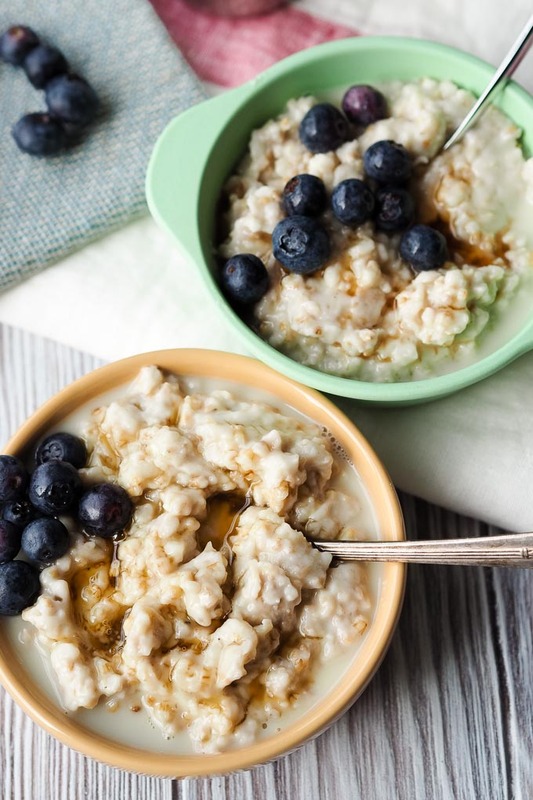 Love this slow cooker oatmeal recipe? Find more porridge recipes on The Worktop. I experimented with slow cooker steel oats a year or so ago and was dissuaded by the resulting crusty mess and annoying cleanup. 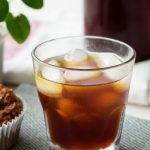 I just gave this method a try using one 13.5 oz can of coconut milk, 7.5 cups of water and two cups of steel cut oats. I gave my slow cooker a light mist of cooking spray and used the KEEP WARM setting, which I switched on a 9:30pm. At 8am (10.5 hours on Keep Warm), the results are amazing! Perfectly cooked oats and absolutely no crusty sticky mess! I’m so glad to hear that you tried making the slow cooker steel oats again, and thanks or leaving the feedback. Can you use regular milk instead? Hi Susie. Yes, you can. It won’t be as creamy or have the same richness, but it’s possible. Enjoy! What steam release method do you use with your Breville? Hi Charles, so the Breville uses an automatic steam release valve system so you don’t have to set anything for the slow cooker function. It’s different from the Instant Pot, where you need to set the steam release handle to the “venting” position during slow cook. Hi what a good recipe. Your details and explanation are very clear and very helpful.. Good job ! I love it. I will try to make it. Hi what a good recipe. Your details and explanation are very clear and very helpful. Good job! I love it. I will try to make it.